A need to express his desire and hope for the promises of God's kingdom in a radical way led the founder of the community, Br Enzo - in those years an economics student at the University of Turin - to meet regularly in his Turin apartment at 8 Via Piave with a small group of Catholic, Baptist and Waldensian young adults, beginning in 1963. The group read the Bible together weekly, gathered every evening for the prayer of the hours, and celebrated the Eucharist together at Br. Enzo’s home as a group associated with the domus of the organization Pro Civitate Christiana. They were convinced that only if they remained poor, small, and aware first and foremost of the importance of sharing and listening would they become the "little flock" open to the fulfilment of the Lord's promises. With time, several members of the group began to discover a vocation to community life and celibacy. Br. 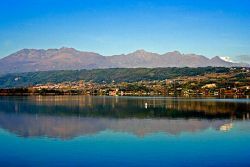 Enzo decided to look for a quiet, rural location outside Turin, a meeting place everyone could reach, and where it would be possible to begin living in community. He found and rented a simple house at Bose, a small village outside the town of Magnano, on the moraine ridge between Ivrea and Biella. The group of friends from Via Piave organized a work camp to restore the beautiful Romanesque church of San Secondo, located a half mile from the dairy farms at Bose. This was the group's last activity together. When Br Enzo decided to move permanently to the small house, which at that time lacked electricity, a sewage system and running water, he found himself alone. Several members of the Via Piave group continued to visit him, and new faces appeared as others heard of the place and came seeking solitude and prayer. Still, after he moved to Bose on 8 December 1965, the last day of the Second Vatican Council, Br Enzo lived almost three years in profound solitude. These were precious years devoted to prayer and hospitality, offered to those who occasionally stopped by Bose for a moment of silence and to listen to the Word of God. During this time Br Enzo also had the opportunity to deepen his understanding of his vocation by visiting Catholic monasteries (the Trappists of Tamié in France), Orthodox monasteries (at Mount Athos), and reformed communities (the Taizé Community in France, whose members at that time were all Protestants). Also influential were conversations and friendships with individuals who shared with him something of their profound spiritual insight, such as the Cardinal of Turin Michele Pellegrino, and the unforgettable Patriarch of Constantinople Athenagoras. In addition to the trials of living in solitude, Br Enzo faced incomprehension from the local bishop: on 7 November 1967 all public liturgical celebrations were prohibited at Bose, a measure taken largely because of the frequent presence of non-Catholics among Br. Enzo’s guests. Despite the great pain the bishop's decision caused him, Br Enzo as fully as he had obeyed the demands of solitary life, convinced that the seed he had planted could only grow and acquire meaning within the Church. On 29 June 1968 Cardinal Pellegrino, who had come to Magnano to lead a conference on “the primacy of Peter,” lifted the prohibition and celebrated Mass with all who were present that day at Bose. A few months later, in October 1968, the long wait came to an end: two young Catholics (Domenico Ciardi and Maritè Calloni) and a Protestant minister from Switzerland (Daniel Attinger) came to join Br. Enzo. A sister from the Protestant community of Grandchamp also arrived, sent by the prioress of the community, Sr. Minke De Vries, in response to a request by Br. Enzo. 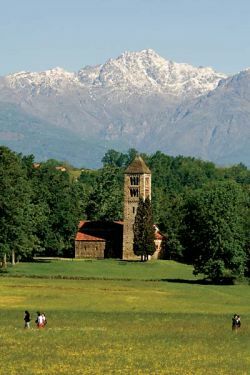 "On a hill near Biella, for the past two years, a group of Christians of different denominations has occupied, a small group of houses, abandoned when the few inhabitants left for the city. They can hardly be called houses: the wind whistles through the open crevices, and the mist that envelops the buildings seems to be on the verge of dismantling them and carrying them away. There isn’t even electricity. There is the paradoxical faith of these friends who intend to prepare, in absolute poverty, the Christianity of tommorow."